This town is located 340 km southwest of Paris. James is shown dressed in armour and an ermine cape. He wears the blue sash of the Order of the Garter and the green ribbon of the Order of the Thistle. The Nantes portrait is most similar to the version in the Scottish National Portrait Gallery; another version is now in the Drambuie Collection. 1 Claire Gerin-Pierre, Catalogue des peintures françaises XVIe-XVIIIe siècle (Nantes: Musée des Beaux-Arts de Nantes, 2005), 49. The portrait measures 72 cm high X 59 cm wide. Nicolas de Largillière was born in Paris in 1656, and died there in 1746. He painted several portraits of James III and VIII when still Prince of Wales, as well as a family portrait of James with his parents. 2 Cf. Edward Corp, The King Over the Water: Portraits of the Stuarts in Exile after 1689 (Edinburgh: Scottish National Portrait Gallery, 2001), 64-65. Martin van Meytens was born in Stockholm in 1695, and died in Vienna in 1770. 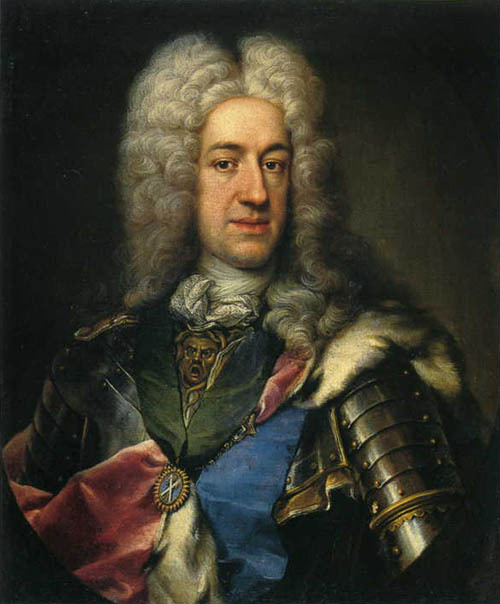 In 1725 he painted portraits of King James III and VIII and Queen Clementina, copies of which are now in the Scottish National Portrait Gallery. A copy of Meytens portrait of Clementina is now in the Palazzo Pallavicini Rospigliosi in Rome. Image 1 (James III and VIII): Gerin-Pierre, 49. This page is maintained by Noel S. McFerran (noel.mcferran@rogers.com) and was last updated July 21, 2008. © Noel S. McFerran 2008.